After a tiring journey, we were glad to check into this beautiful heritage hotel. The beautiful aesthetics, typical of the Bhutanese paintings and artwork reminded me of the ones in Bali. We fell in love with our rooms: a mini-living area with low seating sofas, cushions and curtains all carrying the country's trademark patterns and colours. The adjoining bedroom was warm, inviting and spacious too. 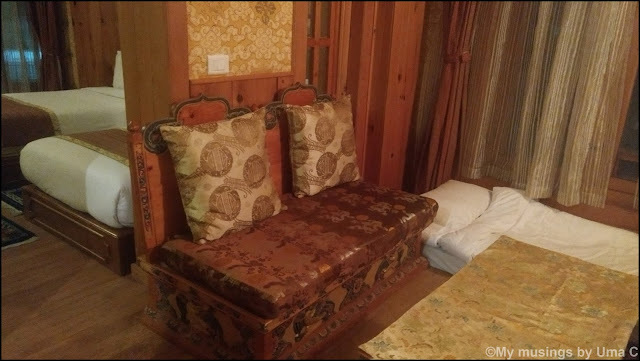 We joked that a hotel room of this size could well be someone's house in Mumbai's suburbs. Early next morning we left to see the sights around the city but not before we stopped at yet another immigration office to get our permits done for Punakha. However, this was nothing compared to the elaborate one at Phuentsholing. Our driver got it done for us while we clicked pics of the adjoining beautiful lanes. The warm sun reflected off the bright blue skies that peeked out in turns from behind the spongy curtain of clouds that hung over the green, densely vegetated mountains. That's the traditional dress worn by the Bhutanese. All of them, old and young, men and women, little boys and girls, school going children and working adults wear only their traditional clothing. For the women, it's something like a wrap around skirt with a formal blouse, called Kira. For the men, it's like a long colorful bathrobe folded under the waist to resemble a dress, called Gho, that falls just a little below the knees. The rest of the legs is covered with long stockings and shoes. Personally, I thought the Kira looked far better and smarter to wear than the Gho. The sister and I immediately made plans to get our snaps clicked in those outfits. The husbands, not surprisingly, weren't too excited at the prospect but they did not have much choice in this matter! Thimpu is not a large city geographically and for a capital city, one might expect it to bustle with energy and activities. However, there's just a general calm prevailing amongst the people and life's rather slow and predictable. In fact, we found Phuentsholing far more brisk and prompt in pace and attitude. Built in the memory of the third king, this place is a revered and sacred place for the Buddhists. You can see several people circumambulating the structure and chanting outside the Chorten with the prayer wheel. The chant goes, "Om Mani Padme Hoon". It's a standard and universal mantra here that's found written over many structures, over colourful cloth buntings that flutter at strategic locations across the city and country. 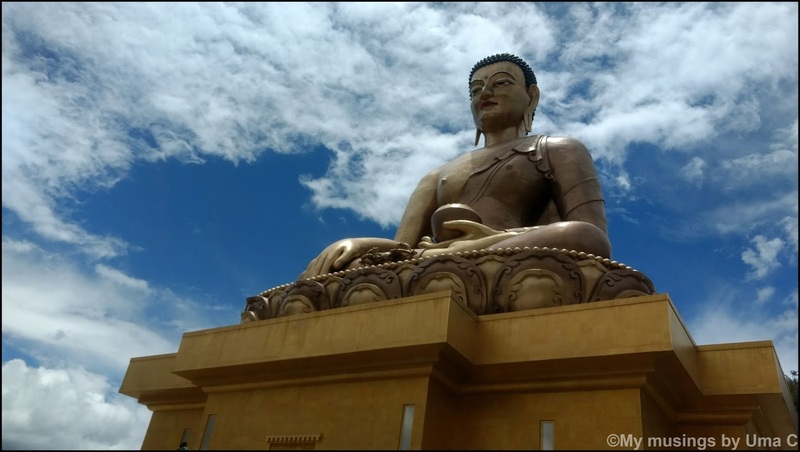 This 51 meters tall giant Buddha statue made of bronze sits overlooking the city of Thimpu and lends a calming atmosphere as soon as one steps in here. The statue sits above a two-storeyed elevated structure, one of which is a prayer hall dedicated to the Buddha. The legend has it that Guru Padmasambhava or Guru Rinpoche as he is popularly known prophesied in the 8th century that a large statue of Buddha would be built in the twentieth century that would bestow peace and happiness to people all over. Guru Rinpoche is considered as the second Buddha by Buddhists as he was instrumental in reaching the Buddha's teachings to the common people. Temples all over Bhutan worship the trio of the Guru, the Buddha himself, and the Lama Zhabdrung who unified all the kingdoms under one peaceful nation. 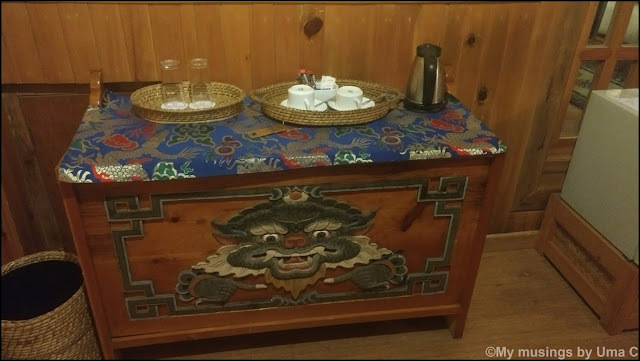 This also forms the core of the mythology and folklore of Bhutan's culture and traditions. A panoramic view of the surrounding structure and area from the Budda statue elevation. 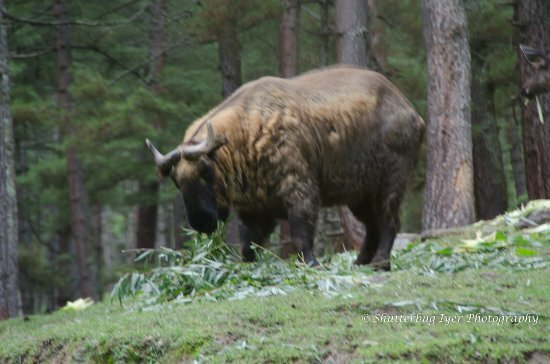 Takin is the national animal of Bhutan. It looks like a hybrid of a goat and a cow. We went to visit this unique creature at the reserve. The Preservatory is a small zoo where these rare species are housed. You need to walk around a bit to spot these animals in their natural habitat but unfortunately, a steady downpour caught us off guard. Although we went armed with umbrellas and jackets, they were all within the safety of our vehicle. So, we decided to make do with the first view of the creature from a rather long distance and hastened back. 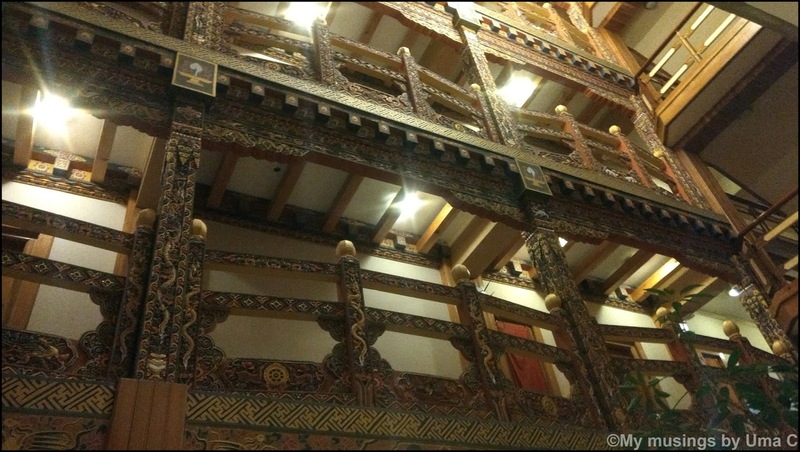 This museum is an insight to how the ancestors lived in Bhutan. One can see the iron cast vessels to the various tools used for hunting and cooking, the horse saddles, the food used for traditional cooking. The museum itself is housed in an ancient house with 2-3 storeys. Narrow, wooden steps lead you to each floor and then to the attic. 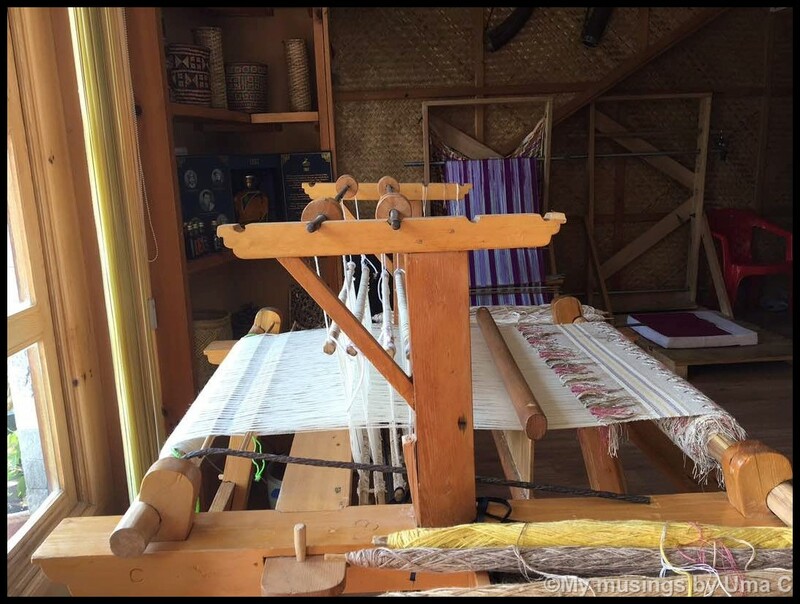 We do not have any snaps of these weavers from the museum but clicked a few at the in-house store of our Hotel. 1. The Indian currency is largely accepted across Bhutan except for the new 2000 rupee notes and in some places the new 500 rupee notes. 2. Cards are accepted at prominent Hotels but for the smaller stores, it's advisable to carry change in Bhutan currency (ngultrum which is equivalent in value to INR). We got some cash exchanged at our Hotel in Phuentsholing itself. 3. 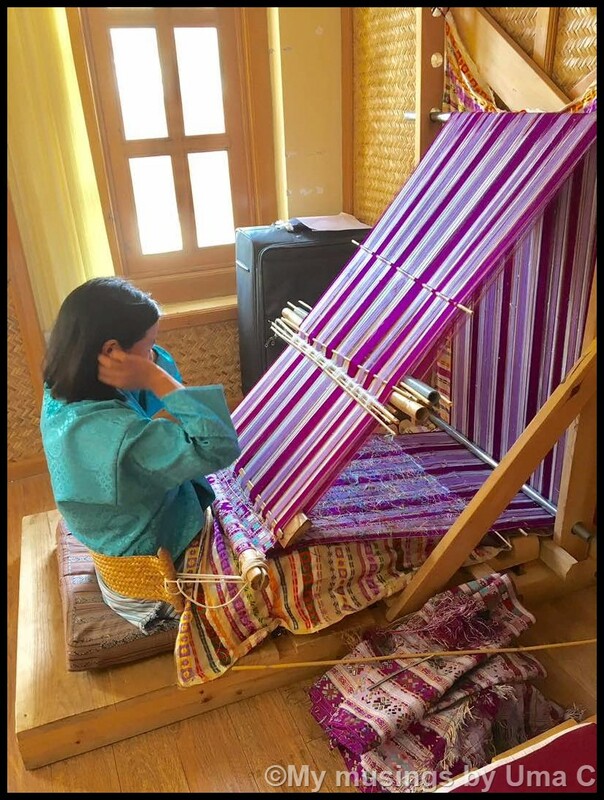 We observed a lot of working women around Bhutan at the Hotels we stayed or around the city in general (as you can also observe from the weaving pics above), and we found that Bhutan is a matriarchal society with about 60% of businesses run by women. 4. If you're interested in viewing the cultural dance, you can inform your travel agent or the Hotel you're staying at well in advance since that needs to be specially arranged for (during the non-festival period). 5. Most travel operators offer just a day's sight seeing in Thimpu and we thought it was sufficient. But, if you're looking for more sights, we hear that one can visit the National Library and a couple of Dzongs. 6. At the Dordenma, we realized the need for a local guide who can explain the history and background in detail. However, as we inquired with our driver, we understood that usually tourists come armed beforehand with guides arranged by their tour operator and a separate guide at selected sights is hard to find. Having said that, as we progressed on our trip, we found a guide at the Punakha Dzong and one again for Tiger's Nest, Paro. So, the right approach will be to ask your tour operator first and then at the Hotels you are put up at. It is also not required to have a guide at all locations. We stayed only for a day in Thimpu. We stopped by at the local handicraft market before retiring to the Hotel for the day. The handmade curios are no doubt attractive but unless you're really keen the price is a deterrent to casual shopping lovers. Even a small metal keychain starts at around INR 250, so it's not really a shopper's paradise. Our next stop is Punakha. Stay tuned! 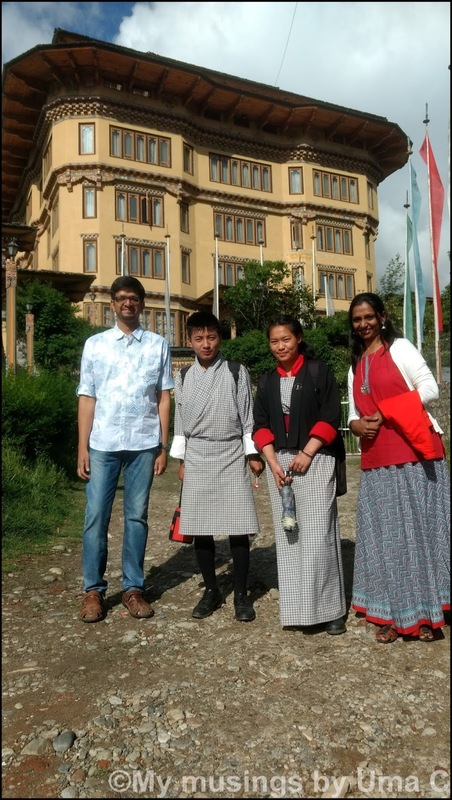 Have you been to Thimpu? Do share your views and thoughts. Uma I have been following your Bhutan posts.. Infact a couple of months back we had planned this trip which never quite took off. Still have my ready itenary. I was planning to take a train from seldeah station to the border town in West Bengal ( forgot the name) and phuentsholing is around 15 kms from there. I assume from your post phuentsholing showing has nothing much of importance, right? How far is the drive from phuentsholing to thimpu? And the terrain??? Hey Ramya, I'm not aware of train routes but just a couple of days back a friend's friend remarked that she's planning to take the train upto Jaigaon (that's the last town on the Indian territory). Phuentsholing is a border town and we did not explore much as we were told there isn't much to do. It's a small but vibrant town with plenty of stores and supplies. In fact, we hear that the people of Bhutan get their supplies in bulk from here. It takes about 5-6 hours to get to Thimpu and it's a mountainous terrain, so pretty winding. Hope this helps. This was such a joy to read, Uma. The entire tour of Thimphu is very useful. I have bookmarked the post for future use. I'm glad you liked it Rachna. Hope you find it useful when you plan your trip. Your pictures are absolutely stunning! I am definitely bookmarking these for my future Bhutan trip. Those outfits look lovely and oh, the Buddhas! I have a special fondness for Buddha statues. I can stand and stare at them for hours on end. They are simply splendid. What a lovely, detailed account, Uma. Very useful for travellers, for sure. Thank you, Shailaja! Indeed, Buddha and more Buddhas everywhere is what makes Bhutan such a calm and peaceful place. I'm glad to know this post can be used as a reference material. I've painstaking jotted down these points so that someone can benefit. Do let me know when you decide to go. What a lovely, detailed travelogue. This is so helpful and with your stunning captures, I can't wait to visit Bhutan. Thank you so much, Aditi! You'll love this place. Hi Uma, have been following your posts on the Bhutan trip. I do hope to visit Bhutan some time in the near future. You have given insightful info on doing the right things and also shared info on what didn't work for you. That is mighty helpful since most of us are not seasoned travelers but naive ones! Lovely captures and the what shines through the post is how much you enjoyed the trip. Thanks a lot, Kala for your kind words. Happy to know that. Glad to be of help.